Whether you are brand new to YouTube or you have been on the site for a while, we are here to help. In this guide, we will walk you through the steps to grow a YouTube channel from scratch. Is Your Dream To Start A YouTube Channel? Tyler is a 15-year-old boy who plays a couple times a week on a PS4. Despite this, he isn’t dedicated to the point of considering himself a “gamer.” Sometimes he needs ideas for dealing with a particularly challenging in-game task, and wants to know what other gamers have done. Most times he just enjoys the humor. His girlfriend, 14-year-old Linda, isn’t an avid gamer either, but she’s starting to take an interest. She plays now and again, and also watches a lot of Let’s Play videos for their entertainment value. She’s picked up on a number of Tyler’s subscriptions. Knowing why users enjoy your videos is very important. If you know that users are mostly tuning in for walkthroughs, you can focus on providing useful strategies. If you discover they are tuning in mostly for your sense of humor, you can focus more on just being funny. Now that you have a more solid idea of who you are targeting, you are ready to fine-tune your marketing efforts. One thing that is important to point out here is that you need to focus on fans who are actually active on YouTube. Cross-promoting is a good idea, but you cannot assume that the users you target on Facebook, Twitter, and other sites are active on YouTube as well. They may be members of the same target demographic, but that does not guarantee that they will help you to grow your YouTube channel. So let’s look at PewDiePie’s channel as an example. Across the top of the page, you can see a large banner. 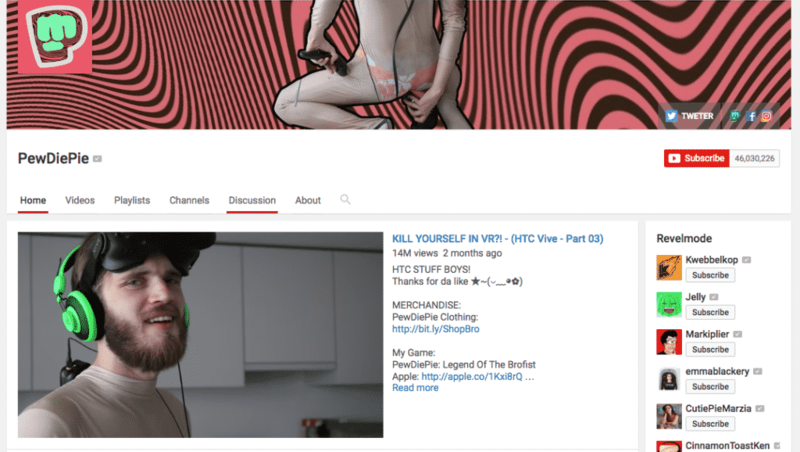 That is PewDiePie’s channel art, which is currently a promotion for his Virtual Reality In Public video. It is smart to regularly change your channel art. This keeps your page looking fresh and it draws attention to your latest videos, products, or projects. You will notice social media links in the lower right-hand portion of the channel art. In the upper left you can see PewDiePie’s icon. Your icon represents you throughout YouTube. Choose something that displays well large or small. Next, optimize your “About” section. Here you can input a description of your channel and provide contact information and links. If you are cross-promoting on your own website, Facebook, Twitter, etc., be sure to use consistent branding. Use the same fonts, colors, designs, and logos. You want everyone to know instantly that they have arrived at the right place. While you were checking out PewDiePie’s channel, you probably also noticed he does an amazing job organizing his content using channel sections. With a section, you can group together related videos. This helps your audience to find content which will interest them. You can see how this makes it a breeze for users to find what they are looking for. If you want to watch a completed playthrough, click on the All Finished Playthroughs section. 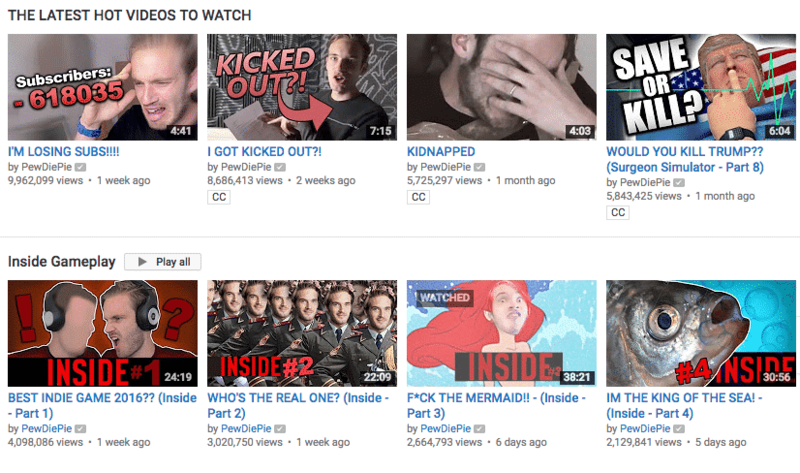 If you want to watch an episode of Scare PewDiePie, you can find them all right there in that channel section. Contrast that with the mess you find on channels that don’t have organized sections. Nothing is worse than having to skim through videos which appear in upload order without any further categorization. With only the names and thumbnails to go by, it can be next to impossible to find what you want. Oftentimes, users just give up in frustration. So organize your channel! You can create up to 10 custom channel sections. Note: If you have been on YouTube for a while, you may know sections by a different name: playlists. YouTube has recently changed their lingo. This may be a bit confusing at first, but they are exactly the same thing. As I discussed previously, your target market is on YouTube. But you need to target active users within that group. How do you do that? Where do you find them? The answer is to turn to videos which are similar to yours and draw the same audience. There are numerous forms that YouTube collaborations can take. You can create a short comedic sketch together, or maybe a shared review. Another idea is to make a video entirely on your own and host it on your collaborator’s channel. Your partner can then make a video to host on yours. You can also make videos where you react to each others’ videos or products. Or you can work together to make an amazing how-to video. There literally is no limit to the great ideas you can come up with using a little creativity. Put your heads together and you will come up with even more awesome possibilities. YouTube has an excellent guide on Collaboration here. Another way that you can work with other YouTubers is to set up your Featured Channels section. Add channels here that you want to promote. This is a great place to promote your friends and collaborators. For example, PewDiePie is promoting his girlfriend’s channel here, CutiePieMarzia. This is a great opportunity to promote your competitors too. That might sound weird, but the idea is to build up an association between your channel and those in your niche which are already successful. That way you pick up on some of their authority (and hopefully their followers). Be sure that you always tell other YouTubers when you add them to your Featured Channels. You will not get a response every time, but sometimes you will find that this leads to further collaboration and cross-promotion. They may also decide to add your channel to their Featured Channels. At that point you have a great working relationship which can really grow your audience. Just how much growth can you get from collaborating with other YouTubers? There is a great case study on Zoe Sugg, a.k.a. Zoella. In 2014, she grew her subscriber-base from one million to five million users. During this time, she created an average of one collaboration video every month. Each was featured on another user’s channel and included a call to action to subscribe to her channel. Every single video led to a spike in new subscribers. This is the simplest tactic in the world, and yet numerous YouTubers forget to employ it. If you want people to subscribe to your channel, you need to ask them to do it! Internet users are notorious for their short attention spans as well as their tendency to simply move along. They may have enjoyed your videos, but they will probably just click out of their browser and forget about you unless you remind them to follow you. What a waste that would be. This is why you should add annotations to your videos. With annotations, you can layer all kinds of useful information over your content. This can include links, text, and hotspots. You can invite users to subscribe at any point during your videos, but you should always remember to do it at the end. Personally ask for subscriptions, and then layer on the link to subscribe. Users click the annotation and effortlessly are able to follow you. If you follow all of the suggestions above with diligence, you should gradually start seeing results. But it can take a long time to grow a channel organically from scratch. The problem is that users who click through to your channel look at your statistics and see that you don’t have many subscribers. Because of this, they may not see you as particularly relevant. As a result, they then click away and watch something else. When your channel has a lot of plays, likes and subscribers, you have something known as Social Proof, which means that people see your numbers and perceive that you are already popular. This produces a bandwagon effect, where they want to jump onboard and see what you have to offer. Your established competitors are already way ahead of you in terms of likes and subscribers. It’s not a level playing field. Buying likes and subscribers is one way to catch up fast. If you decide to buy subscribers, make sure that you go with a service that drip-feeds new followers from aged accounts. That way the growth looks organic, even though it isn’t. Otherwise, buying subscribers could easily backfire on you. So long as you choose a quality provider, you should see excellent results. Need help finding a quality provider? Read our list of the top 10 places where you can buy YouTube views. YouTube is a realm of abundant opportunity. With over a billion users, pretty much every target market imaginable has a presence on the massive video-sharing platform. Targeting active users can be a challenge though. It is also difficult to generate visibility on a site that is constantly flooded with fresh content. 1. Conduct market research to identify your fans. Understand your fans’ lifestyles and habits, and in particular, why they watch your videos. Make sure you know what categories to upload your videos to in order to reach the right demographic. 2. Optimize your profile and channel branding. 3. Organize your channel using helpful sections. This makes it fast and easy for users to find videos that interest them. 4. Comment on recently uploaded videos which are similar to yours and getting a lot of attention from active users. 5. Collaborate with other YouTube users and make use of Featured Channels. 6. Ask for subscribers. Embed calls to action in your videos using annotations. 7. Buy plays, likes, and subscribers. YouTube success will not happen overnight. It can take many months of sustained effort to reach a level of visibility where you have a shot at going viral. Building a strong channel however gives you a core audience of dedicated subscribers. These devoted fans will tide you over and will help you spread the word. Who knows—eventually you could become the next PewDiePie!